Chambliss, who was first elected to the U.S. House of Representatives to represent Georgia’s 8th District in 1994, served on the House Agriculture Committee from 1995-2002. He played an integral role in developing the section of the 1996 farm bill that deals with the crops and livestock farmers produce. He chaired the House Agriculture Committee’s Subcommittee on General Farm Commodities & Risk Management while the 2002 farm bill was developed. 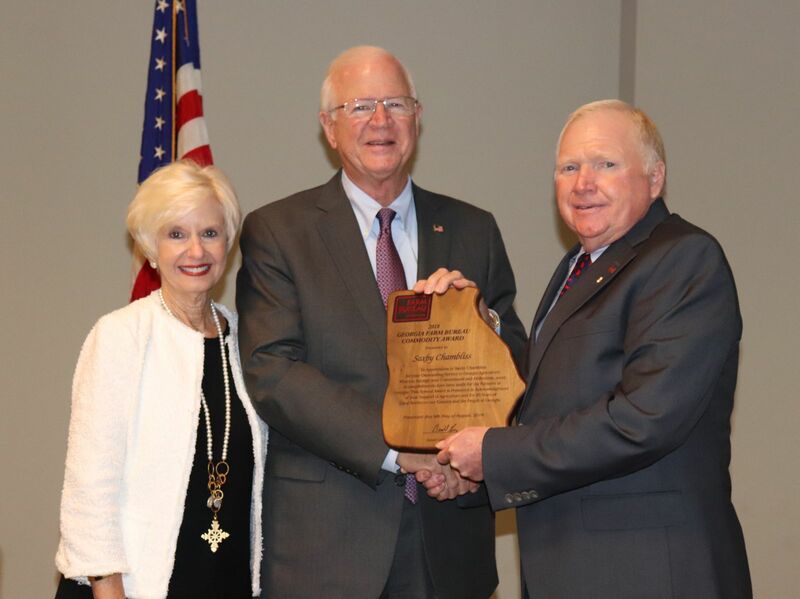 In this role, Chambliss worked closely with then House Agriculture Committee Chairman Larry Combest and Ranking Member Charlie Stenholm to reform the federal crop insurance program to make it more affordable and an effective risk management tool for farmers. When work began on the 2002 farm bill, Chambliss conducted hearings across the U.S. to receive input from farmers as to which farm bill programs did and did not work. Before Chambliss ran for Congress in 1994, he saw how agriculture drove the economy in Southwest Georgia as he practiced law in Moultrie and raised a family. After serving eight years in the House, Chambliss was elected to the U.S. Senate in 2002. From 2005 to 2007, Chambliss chaired the Senate Agriculture Committee and served as the ranking member of the committee from 2007-2011. During development of the Food, Conservation & Energy Act of 2008, Chambliss advocated for the priorities of agriculture and rural areas during lengthy Senate debates and was a key negotiator of the final farm bill as a member of the House-Senate Conference Committee. Chambliss was a leader in drafting much of the 2014 farm bill pertaining to agricultural commodities and again served as a leader on the House-Senate Conference Committee. With Georgia having multiple military bases, Chambliss served on both the House and Senate Intelligence Committees dealing with national security issues and intelligence gathering. He chaired the House Intelligence Subcommittee on Terrorism and Homeland Security, which oversaw investigations of the intelligence community after the September 11 attacks in 2001. He helped write numerous defense authorization bills and helped secure funding for the dredging of the Port of Savannah so it can accommodate larger ships coming through the expanded Panama Canal. After retiring from the Senate in 2014, Chambliss became a partner with the law firm DLA Piper in Atlanta where he works with clients on cybersecurity issues. He also teaches a class each fall at the UGA School of Law on political leadership and is a visiting lecturer at the UGA School of Public Policy & International Affairs. Chambliss and his wife, Julianne, have two adult children, Bo and Lia, and six grandchildren. They are members of St. Mark’s Anglican Church in Moultrie. Founded in 1937, Georgia Farm Bureau is the state’s largest general farm organization and has 158 county offices. Its volunteer members participate in local, state and national activities that promote agriculture awareness to their non-farming neighbors. GFB offers its members a wide variety of benefits, including insurance, but enrollment in any of the member benefits is optional and not a requirement for membership.